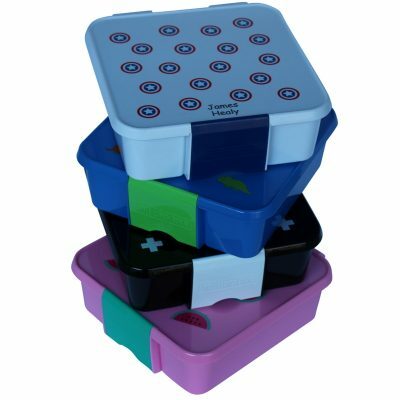 This stackable bento box comes with 2 different containers – bottom container is one big container, whereas the top one is split it two by a divider. The lid/divider lid for the bottom container got slots to fit in the fork, knife and spoon which comes with the lunch box. Very easy to use – fill the bottom container, put lid with the cutlery on top, then fill the top container and put the top lid on and finish off by wrapping the sealing strap around the containers to keep them together. It is also possible to use the the containers separately if you only need a small lunch/snack. If using the bottom container you need to put on the divider lid and then the top lid and hold it all together with the sealing strap the normal way. If you only use the top container with top lid you need to hold it together with the sealing strap strapped the long way to hold tight. Ok in micro wave and dish washer safe too – sealing strap only hand wash if needed. Please note this lunch box is not leak proof. This lunch box fits in to all the insulated lunch bags we stock.